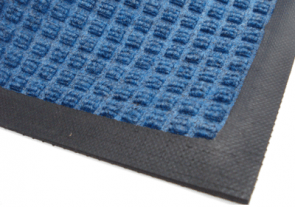 Waterhog mats are the industry leader in premier entrance mats. Waterhog floor mats are popular in both commercial and residential settings, and these mats are all 100% American made. 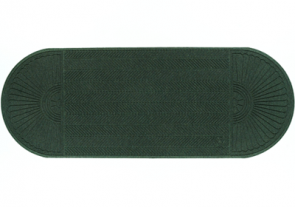 These door mats are known for their distinctive appearance. They are made of crush-proof polypropylene material. This material aggressively cleans dirt and debris while trapping it below the surface. 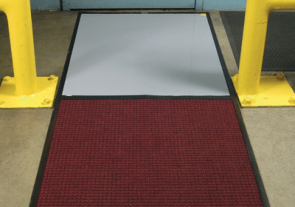 Waterhog entrance mats derive their cleaning ability from signature "nubs" on their surface. These raised nubs effectively clean while channeling debris and moisture deep below the mat's surface. 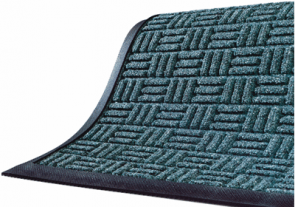 Waterhog mats are available in a variety of surface patterns. 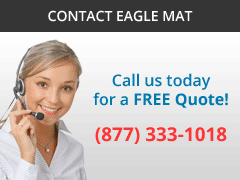 Eagle Mat offers Waterhog mats with diamond, basket weave, and diagonal patterns. 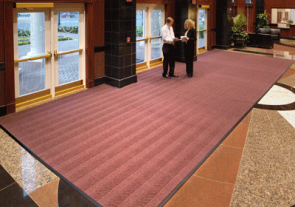 Waterhog matting is best used in entryways, lobbies, and other premier commercial locations. 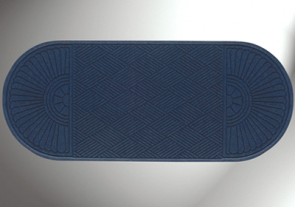 Waterhog: 100% Made in the U.S.A.
Waterhog Classic Floor Mats has set the standard for floor mat and entrance matting. The patented raised-square waffle pattern combines the best functionality with an aesthetically pleasing surface design. Environmentally friendly with 20% recycled content. Ideal for moderate to heavy traffic environments both inside and outdoors. Waterhog Classic door mat Water Dam border holds 1.5 gallons of water per sq. yard. Polypropylene crush resistant pattern quickly dries moisture while trapping dirt and debris below the walking surface. 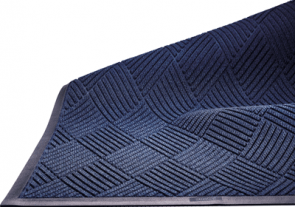 Waterhog Fashion Floor Mats offer a unique matching fabric border to our Waterhog Classic door mat. The patented raised-square waffle pattern combines the best functionality with an aesthetically pleasing crush resistant surface design. Economically friendly with 20% recycled content. Polypropylene nubs quickly absorb and contain moisture. Unique “waffle” design funnels dirt / debris below the mat’s surface. Waterhog Masterpiece is constructed with a raised ridge basket-weave design that traps dirt and moisture deep below the mat’s surface. 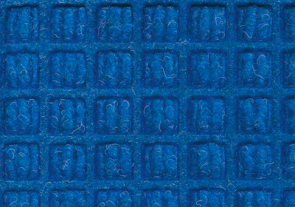 Mat construction features crush resistant polypropylene fabric. Water Dam border allows for quick drying that will not fade or rot. Ideal for moderate to heavy traffic in both indoor and outside applications. 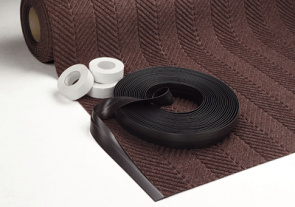 Rubber backed reinforced borders increase strength and durability to the floor mat. Waterhog ECO Elite is constructed of 100% recycled plastic water bottles, making it one of the most Eco-Friendly floor mats on the market today. Mat construction: 100% recycled material! Weather Proof polypropylene fabric enables outdoor application. Ideal for moderate to heavy traffic areas both inside and outdoors. Water Dam technology capable of holding up to 1.5 gallons of water! Crush-resistant herringbone pattern aggressively cleans dirt and debris. Cover large floor spaces while reducing environmental impact with our Waterhog ECO Elite Roll Mat! 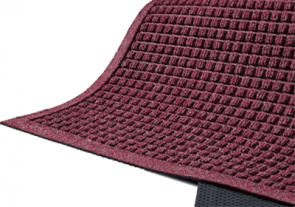 Matting features herringbone design for aggressive multi-directional cleaning! Tough Nitrile rubber back for slip-resistance. 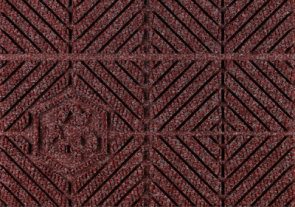 Waterhog herringbone pattern adds to the decor of any application. Waterhog ECO Premier is one of the most Eco-Friendly floor mats on the market today! The crush resistant diamond pattern and straight ridge design aggressively traps dirt and moisture below the walking surface. Ideal for moderate to heavy traffic areas both indoors and outdoors. 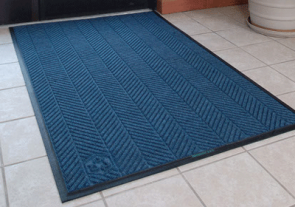 Extend a warm and stylish welcome to your visitors with the Waterhog Grand Elite - One-End mat! 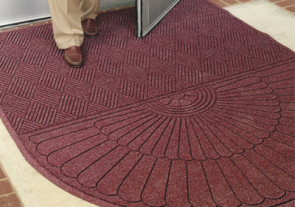 Made of 100% recycled content, this entrance mat features crush-resistant ridges that clean dirt and contain debris! Earn LEED credits with this Certified LEED product! Made of 100% PET recycled bottles, our Waterhog ECO Grand Premier - One-End are the perfect addition to any Eco-Friendly building! Earn LEED certification points with purchase and use! The Waterhog ECO Grand Elite - Two-End is essential in covering large floor spaces in lobbies, reception areas, and outside entryways. Featuring the unique Waterhog crush-resistant ridges, these eco-friendly floor mats effectively clean and contain even the toughest dirt and grime! Use this product and earn LEED certification points! Made entirely of post-consumer recycled content! 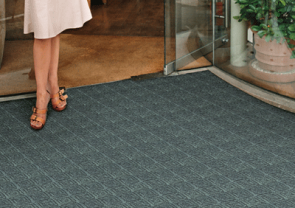 This two-ended mat is ideal for both commercial and residential entryways! Our Waterhog ECO Grand Premier - Two-End mats deliver effective cleaning, dirt control, and stylish decor to a wide range of commercial and residential settings. Earn LEED certification points with this product! 100% recycled surface / Eco-Friendly construction! Waterhog ECO Grand Elite features a half oval design to compliment those first two steps inside or outside a door entrance. 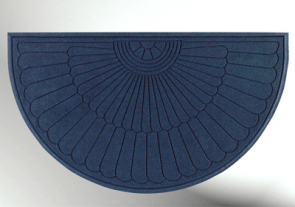 The stylish half oval design offers a different and unique look to common day door mat. Made of 100% recycled content! Ideal for moderate to heavy traffic. Perfect for both indoor and outdoor applications. This Waterhog is one of the most Eco-friendly mats on the market! Waterhog ECO Grand Premier features a half oval design to compliment those first two steps inside or outside a door entrance. 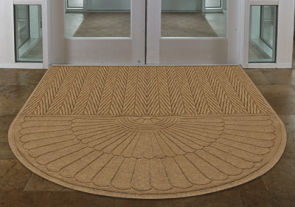 The stylish half oval design is a fashionable take on ordinary front door mats. 100% recycled content makes it the most Eco-friendly product on the market. Patented Waterhog crush resistant polypropylene surface is guaranteed to quickly dry moisture accumulation! Waterhog Elite Roll Mats are another addition to our signature Waterhog line of products. The Waterhog Elite Roll Mat is one of our strongest and stylish mats for recess application. Custom cuts and sizes available! 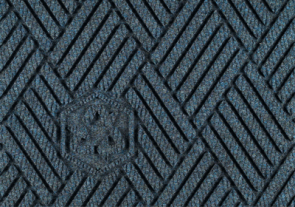 Distinct herringbone pattern is featured from end-to-end. Aggressive in scraping dirt and debris from the bottoms of shoes. Durability reinforced by commercial grade polypropylene fibers and Nitrile rubber backing. The best of both worlds: Waterhog's premier dirt-scrubbing "nub" pattern coupled with a premium sticky mat to control dirt and debris. 90% of dirt is removed and contained in as little as 2 steps forward! Carpet available in 16 eye-catching colors. Simply peel and discard used sticky sheets! Sticky pad contains 60 sheets (60 sheet pad is replaceable). The Waterhog Classic Floor Mat Tile is one of our most popular modular tiles for recessed applications! Available in 1/4" or 7/16" thicknesses. Ideal for moderate to heavy traffic use. Waterhog Classic Floor Tile: An industry standard in recessed matting! Popular in Class A office buildings, lobbies, hospitals, and more. Raised "waffle" crush resistant nubs are great for heavy weight bearing loads and guaranteed not to fade or rot. Waterhog Premier Floor Mat Tile is one of our most popular modular tiles for recessed applications. Waterhog Premier Floor Tile features a diamond design and is an industry standard in recess and entrance matting. Guaranteed not to fade or rot. Available in 1/4" or 7/16" thicknesses, 18"x18" tiles. 50% heavier face weight than our Waterhog Classic Tile. 100% polypropylene quick dry fibers for dispersal of dirt and moisture. Popular in Class A office buildings, lobbies, vestibules, schools, hospitals, and more. Waterhog Diagonal Floor Mat Tile is one of our most popular modular tile for recessed applications. Waterhog Diagonal Floor Tile features a diagonal pattern and is an industry standard in recess and entrance matting making it ideal for moderate to heavy traffic use. 18"x18" square tiles per case. Waterhog Geometric Floor Mat Tile is one of our most popular modular tiles for recessed applications. Waterhog Geometric Floor Tile features a geometric design and is an industry standard! Perfect for use in areas of moderate to heavy traffic. Available in 1/4" or 7/16" thicknesses. 18"x18" square tiles. Popular in Class A office buildings, lobbies, vestibules, schools, and more.